The goal is for the Toranomon Hills Station Tower to transform its neighborhood and serve as a hub for international business. The Office For Metropolitan Architecture (OMA) unveiled designs and renderings for the Toranomon Hills Station Tower, one of three new mixed-use towers planned for the Toranomon district of Minato, Tokyo, Japan. The tower is the firm’s first skyscraper in Tokyo. 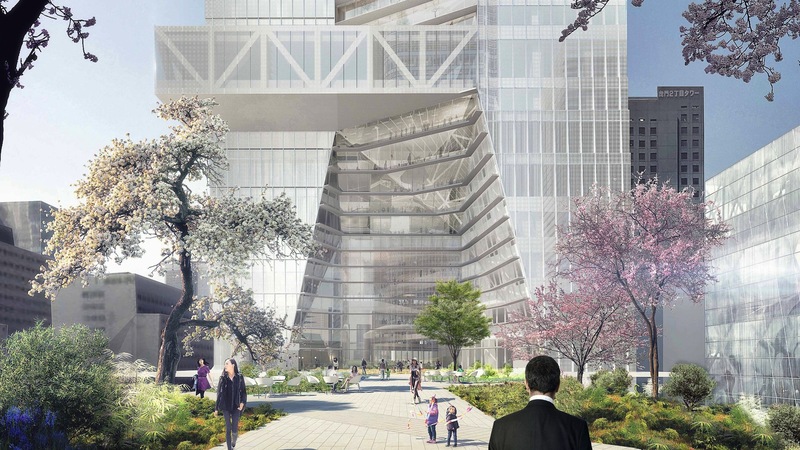 Along with a mix of office, hotel, and retail spaces, the tower features a spacious atrium, an elevated park, a forum, and a multi-story library. It will connect to the new Hibiya Line subway station. Designed by OMA New York’s Shohei Shigematsu, the tower is part of a project led by the Japanese developer Mori Building. The Toranomon Hills Residential Tower and Toranomon Hills Business Tower will be built next to the Station Tower. The tower is scheduled to open in 2022.